Ken Madeiro of Hall Spars stopped by the shop last week for a brief peek, and an hour later we were still talking! Now he’s got the Reliance bug, too. 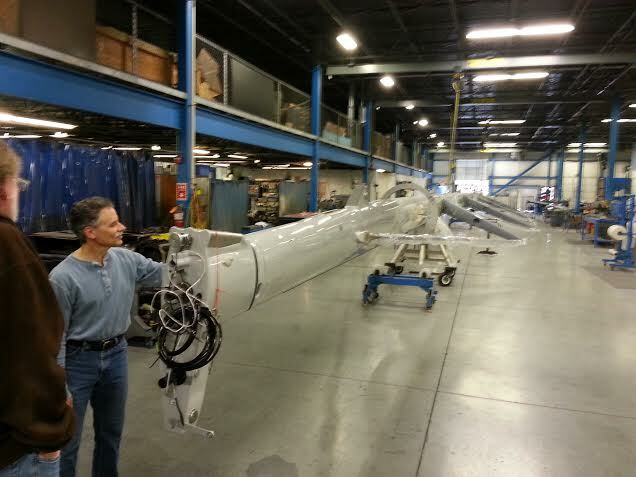 Last Saturday he called to say they were just getting a 154 foot long mast ready for shipment and he wondered if we’d like to see a “big stick.” Since they are a local Bristol firm, Bill Lawton and I hightailed it over. 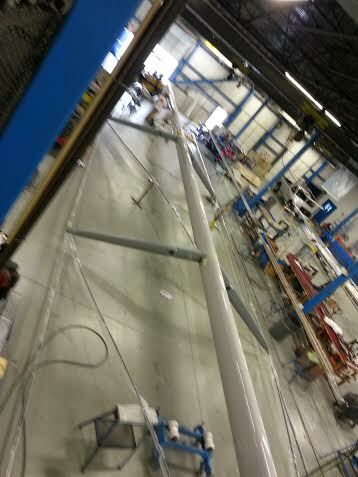 This mast is for a new Baltic 108′ and all up with rigging , paint, hardware and spreaders weighs about 3900 lbs. 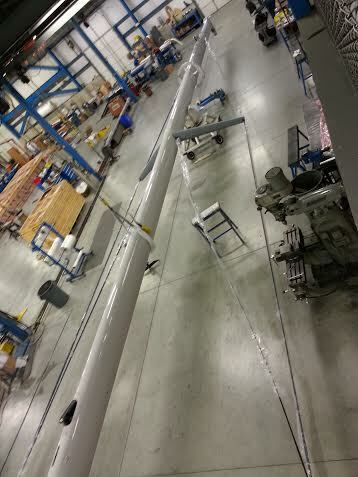 — mast tube with paint and some hardware about 2100 lbs. It’s 21″ fore and aft and 10 3/4 ” side to side . If you look closely in the first picture taken from the foot of the mast you can see Ken standing at the mast head. That’s tall! In the second picture we’re standing at masthead and Ken is talking with Bill. The third and fourth pictures were taken from the second floor looking down. The mast is carbon fiber. Even the shrouds are carbon fiber tapered wing-like from the bottom spreader. Not to be outdone, we casually mentioned RELIANCE’s mast was 112′, telescoping topmast 58′ and yard 68′ for an overall height of about 194′. But we were one-upped! 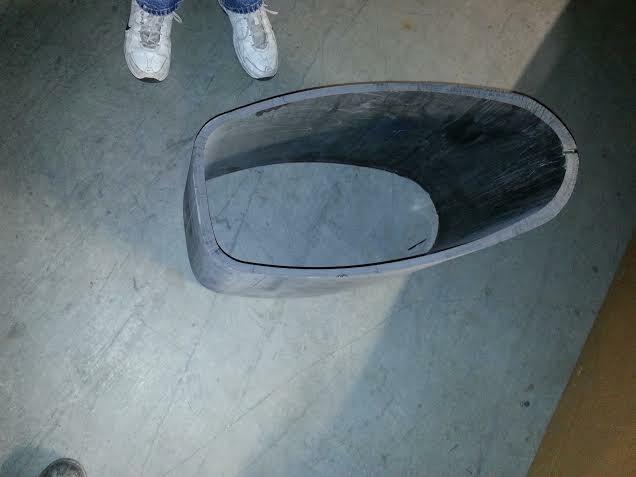 Never brag around the Hall Spar shop… The fifth photo shows a base section from their 218′ tall mast for a Wally 164′. It is 28 1/2″ x 14 1/2″ in cross-section. The full structure weighed about 13,500 lbs., all up with PBO rigging about 16,250 lbs. I wish you could see Hall Spars. Amazing!! We were like kids in a candy store. Have to believe Capt. Nat would have been all over this. Imagine an autoclave large and long enough to “cook” these structures! 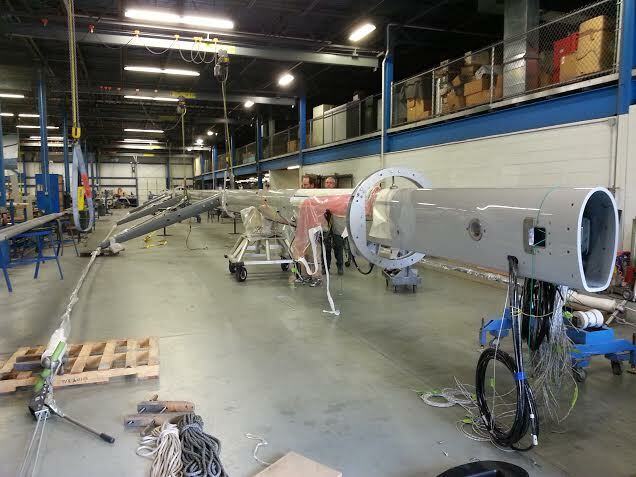 The mandrels, mast tape laying machines for laying carbon fiber tape, and shroud machines! And there was more, they make other stuff too, from UAVs to rocket fairings. I’m hopeful that they’ll take a look at our RELIANCE mast drawings and offer their insights. Maybe they can even estimate how much it weighed. But I’ll save that for another blog. This entry was posted in Project Manager's Welcome and tagged Bill Lawton, Capt. Nat, carbon fiber, Hall Spars, Ken Maderio, RELIANCE on April 8, 2014 by Herreshoff Marine Museum/America's Cup Hall of Fame.